Ptarmigan which was on sale for a long time has finally got the buyer and now being sold at a decent price. The sailing yacht Ptarmigan is 24.89 meters and it was listed for sale at Lilley Marine since long time. The yacht has been sold in an in-house deal recently. The beautiful yacht is built in GRP by Finnish yard Nautor’s Swan and has been designed by German Frers. The yacht was delivered to it’s in the year 2012 as a Swan 82 model. 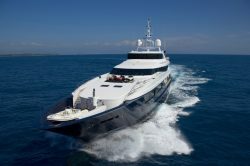 As far as the capacity of this yacht is a concern, the she can accommodate seven guests at a time. To accommodate seven guests, the yacht has three cabins and a master suite with a comfortable queen-sized bed the symbol of luxury and two twin cabins, one of the cabins has a Pullman berth and beside all other cabins have en suite shower facilities and television screens. The living area inside the yacht is elegant and spacious. The saloon area is the hub of the yacht, and it features all mod-cons and a large range of entertainment equipment. On main saloon, starboard side there is a settee with entertainment center and a coffee table. The entertainment center includes an Apple television screen, Bose stereo equipment and video. The yacht also has an L-shaped sofa to accommodate guests who want to sit in the open area with three chairs and a large table. The deck of the yacht is again extremely beautiful and both side of the deck has U-shaped settees of the center cockpit and tables are placed on each side. This creates the perfect spot for al fresco dining on the yacht. And this is also a perfect spot for those who simply want to enjoy the sailing experience. The German Frers designed this yacht as a performance cruiser that brings luxurious interior and stylish lines with high spec features like a carbon fiber deck, a Park Avenue style boom and mast. Ptarmigan has been sold in €3,100,000.